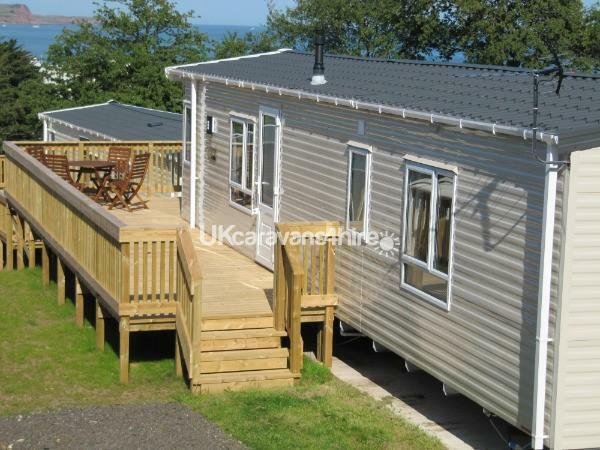 The caravan is available to rent on a weekly basis from January through to December. Prices shown are for 7 night breaks although short breaks are available. Please ask. Short breaks are from Friday to Monday (3 nights) and Monday to Friday (4 nights). A deposit of 25% is required when booking in advance, with full payment no later than 4 weeks prior to the arrival date. Any bookings within 1 month of the date requires payment in full at the time of booking. In addition, a security deposit of £100 is required as insurance to cover any loss or damage. 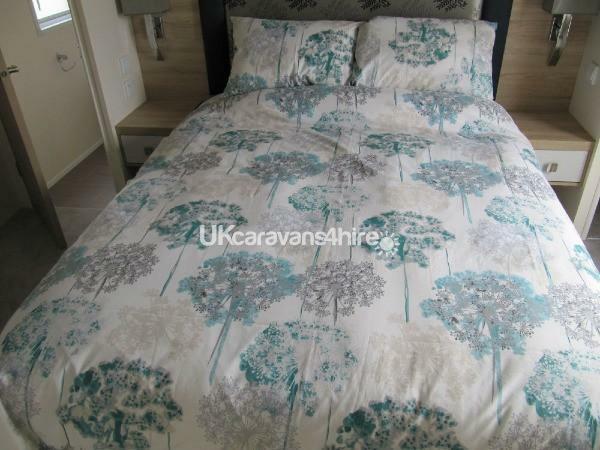 This will be refunded within 2 week of your departure following a successful inspection of the caravan. 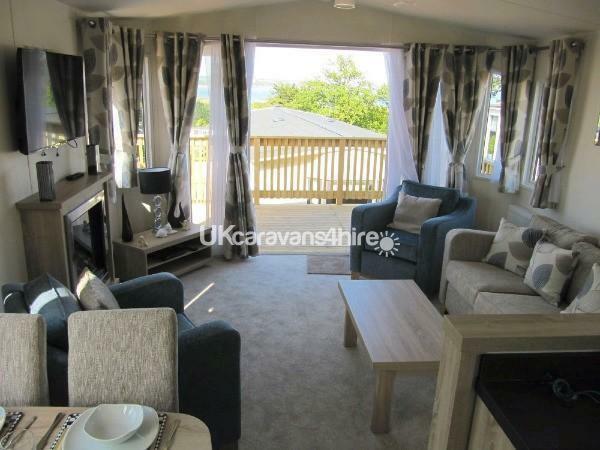 This 39 x 12.6 2015 Sheraton modern open plan Static Caravan, at Oakcliff Holiday Park at Dawlish Warren, comes with parking by the front door and a large veranda. Its location resides with beautiful views over the Exe Estuary towards Exmouth and Exeter and across to the Jurassic coast towards Sidmouth. This luxury caravan is situated in the Paddocks and has a sister caravan (property ref: 2868) just a few yards away in the same block. 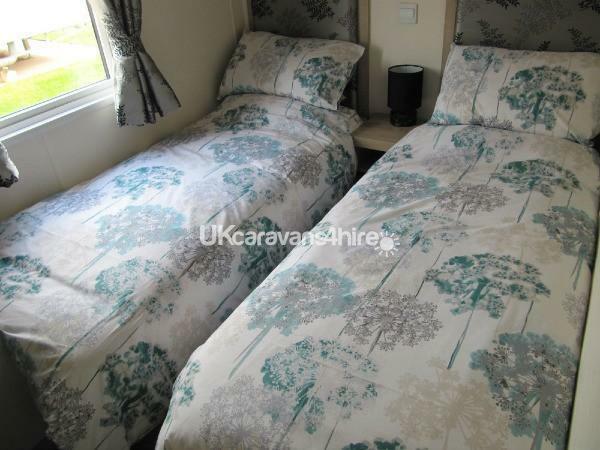 Both caravans are Sheraton 2015 models and identical, with 2 bedrooms each and sleeps 4. 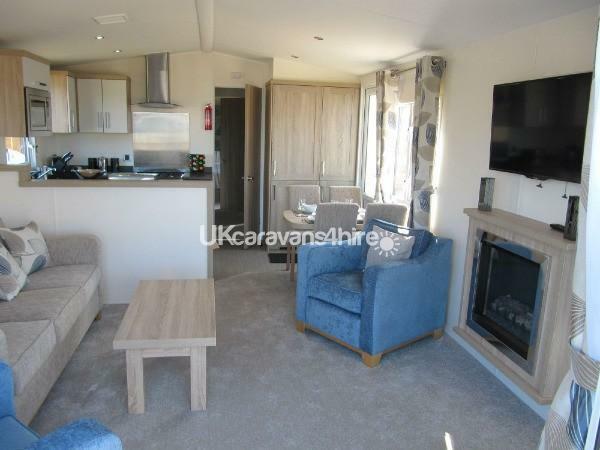 This makes them ideal for larger groups such as family or friends that want to meet up but offering seperate living spaces, both caravans offer a combined party of 8 people (4 bedrooms) when booked at the same time. Please contact me for more information. All pictures are taken from the caravan and are ACTUAL VIEWS. The master bedroom has a King-size bed and TV, a walk in wardrobe along with an en-suite bathroom consisting of toilet, basin and shower unit. The second bedroom is twin bedded with overhead lockers, storage cupboards, draws and wardrobe. The family bathroom contains a toilet, basin and shower unit. All bedding, towels and tea towels are included. Pet friendly caravan and surroundings. No smoking is permitted in the caravan at any time. Oakcliff holiday park is easily accessed by car, train or bus thus making it ideal for those who do not drive. Dawlish Warren is located at the mouth of the Exe Estuary about 2 miles from the centre of Dawlish with its famous black swans. Dawlish Warren station is about 300 yds from the Holiday park, whilst the local buses stop almost outside the gate. On Oakcliff Holiday Park there is free WIFI, a laundrette and outdoor heated pool (open throughout the season), a children's play ground which includes climbing frames, slides and swings that is open all year round. All the main facilities are located about half a mile down the road at its sister site of Lady's Mile. Consisting of entertainment, a takeaway and club house/ restaurant. A gym and sauna (additional charges apply), heated indoor and outdoor swimming pools, an adventure playground, bowling alley and amusement arcade. Dawlish Warren is part of the national 2 cycle route which follows the Exe Estuary all the way through to Exeter passing Cockwood, Starcross and Powderham then down the opposite bank to Exmouth through Exton and Lympstone, all with stunning views passing through the world renowned bird sanctuary on the way. At Starcross bikes can be taken on the ferry across to Exmouth. Within Dawlish Warren all within a short walking distance of Oakcliff holiday park there are numerous Pubs and Restaurants as well as amusements, adventure golf and Go-Karting. There is also an 18 hole Dawlish Warren Gold Club nearby. Places to visit nearby include Torquay and Teignmouth, Kents Cavern, Paington Zoo and Babbacombe. Why not take the train from Dawlish Warren to Paington and catch the steam train to Kingswear and across to Dartmouth, where you can take a cruise up the River Dart to Totnes. 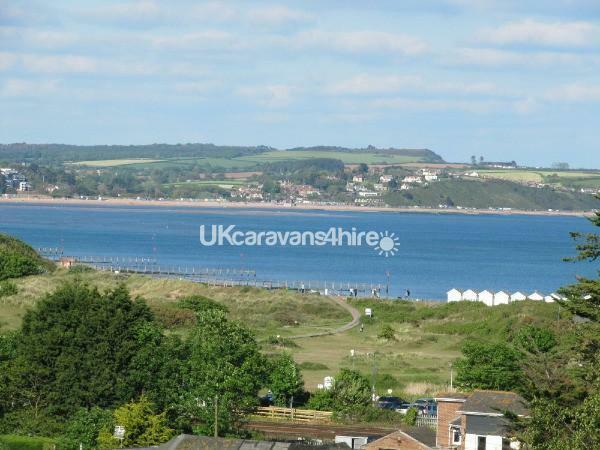 We also have two caravans at Shorefield Country Park, Milford-On-Sea. 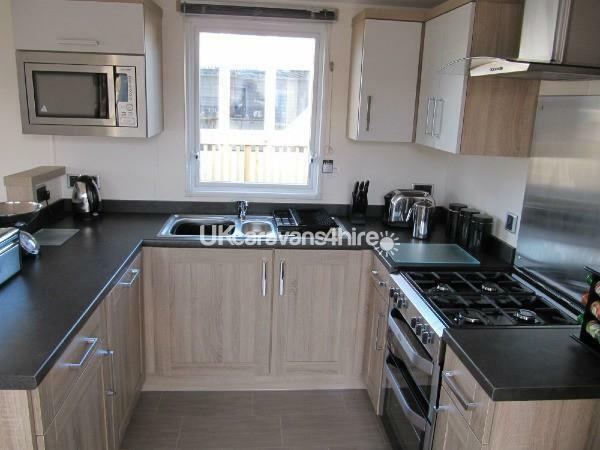 Property Ref: 3430 and Property Ref: 429 on ukcaravans4hire.com. My husband and I with our two small dogs have stayed twice in this caravan and can honestly say our overall experience has been fabulous.We love everything about this caravan and the location.The views are so tranquil and what makes it more special is the safe gated veranda for our dogs.. Not only does it give us peace of mind that our two dogs are safe it would also be an advantage for those who have small children..I would recommend this caravan to all families and those who are apprehensive when taking pets on holiday you will not be disappointed with this holiday home.It's absolutely immaculate..We love it and will definitely be booking again soon..Leaving this review from a very satisfied customer..Thankyou Mike Dickinson ???? 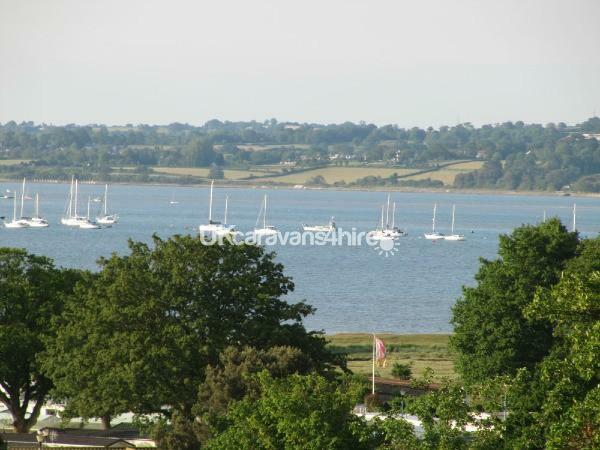 A fabulous holiday caravan in a beautiful location. The views are just stunning. 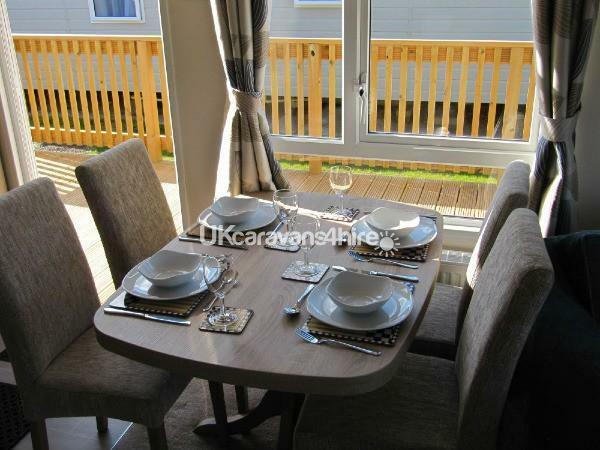 The caravan is very clean and spacious and has everything you could need for a lovely family holiday. A real bonus is the two bathrooms, washer dryer and dishwasher. Already booked for next year. Just back from a week in this property, lovely caravan in great location only a short walk to the beach. Everything you need is in the caravan including a washer/dryer, dishwasher, iron and ironing board. Fabulous pub just opposite the site with lovely food. Would definitely book again. 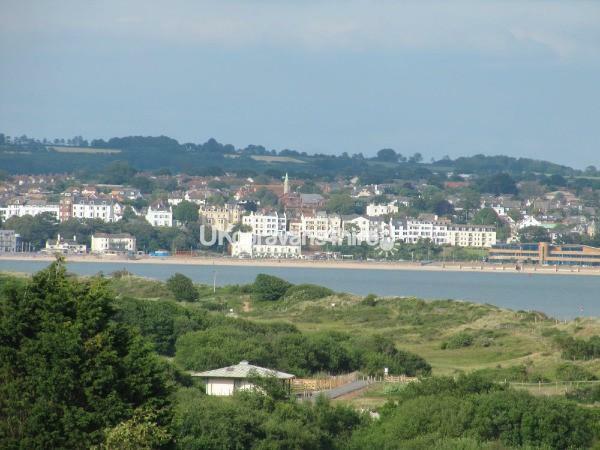 Lovely quiet location with stunning views across the estuary. Lovely dog friendly. caravan nice clean and modern and I am going again enjoyed my stay so much. Beautiful pub by the site 100% great holiday . My friend and I stayed in this van for one week with our three small dogs. The van was superb everything we could possibly want was there. Lovely quiet site superb location and a lovely pub opposite the site entrance which was dog friendly. Superb relaxing holiday and we would defiantly book again. absolutely outstanding caravan. everything about it was just perfect and spotlessly clean. beautiful views and location. would definitely recommend and will certainly be returning. Had a wonderful weekend away in this caravan. 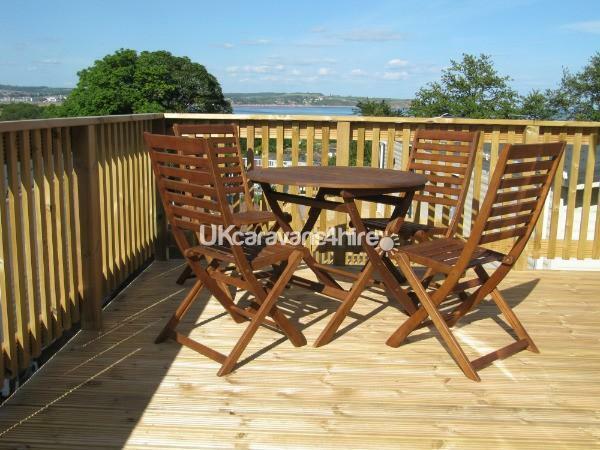 It's situated in the smaller quieter side of the park with great views of Dawlish Warren and Exmouth. It was very peaceful. 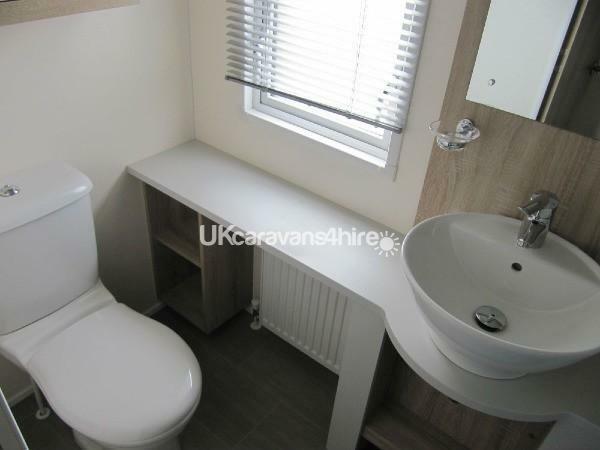 The caravan has everything you would need and is very homely. The booking process was very easy and the owner was very quick to respond and helpful. We would highly recommend this caravan and if we are in the area again we will stay here without hesitation.